This week saw the announcement of the death of Philip Davis. It will pass unremarked upon by the national press, and I expect nearly all the readers of this blog will not have heard the name. But you really should have heard of him, and I hope steps can and will be taken to preserve his legacy. Those of us who grew up before the internet age and the widespread use of computers had to learn a different set of practical skills than today. When I began my training as a surveyor, much of our time was spent either in the drawing office, working on drafting skills on a drawing board with pencil and set squares, or outside in the field gaining practical experience in collecting dimensions using chains and tapes. Although we had pocket calculators, our lecturer used a slide rule (https://en.wikipedia.org/wiki/Slide_rule) for calculations, and would produce an answer far quicker than us and our frenetic button manipulation. Our time on the computers was an hour a week, using a very simple drawing programme to join (literally and figuratively) the dots on the screen. When I moved disciplines from surveying into archaeology, and went to Bournemouth University, I revelled in the Copac computer terminals. I could search for journals and books without having to flick through a paper catalogue and I would begin to remember where certain items were to be found on the shelves. There was also the internet. In the mid 1990s it was not the academic resource we know today, but one of the earliest websites I used regularly was ‘The Castles of Wales’ (http://www.castlewales.com). As an expat living over the border in England, here I could explore the archaeology and history of Wales and begin to formulate ideas about the direction I wanted my academic research to take. Which leads us to Philip Davis. In the 1990s Philip created and curated ‘Gatehouse’, a website he described as The comprehensive online gazetteer and bibliography of the medieval castles, fortifications and palaces of England, Wales, the Channel Isles and the Isle of Man. It is a phenomenal piece of research. By his own admission, Philip was an amateur with no academic qualifications in his chosen field of study, but Gatehouse was, and is, the first port of call for any one interested in researching the history and archaeology of castles. Its breadth and depth of material is quite astonishing, with every castle having an entry, and every entry containing a considerable amount of detail. Drawing on national and regional databases, to which he added additional information, it is the kind of resource I could only dream of twenty years ago. Somehow, if steps have not been taken already to do so, this website should be curated and kept accessible for all to use. I last saw Philip in June. He and I attended a study weekend in Oxford on Medieval and Tudor Gardens. We sat and talked in a courtyard next to the lecture theatre, where we each complimented the other’s work and happily passed the time. I’ve received a phenomenal amount of support to get this far, so it’s only right I should thank people publicly for this. And now, let’s put some flesh on the bare boned facts above. After my operation in 2016 I had to take some time off to recover, only to find I needed another big operation in early 2017 to empty both kidneys of stones. This one really knocked me about and all my writing plans for PhD and publications had to be put back in the ‘to-do’ pile. which had been a long time coming (the conference was held in 2011), and it paired with a paper ‘What does a Mercenary Leave Behind? The Archaeological Evidence for the Estates of Owain Lawgoch’ given in 2005 and published in the conference proceedings in 2008. As the ‘Outlaw/ed Spaces’ book was being published, I submitted two other papers. The first was a paper for a county journal entitled, ‘The History and Archaeology of the Medieval Park of Llwydcoed, Flintshire’. Llwydcoed is a park which is often referenced by medieval historians because of the detailed descriptions of its creation, including a description of how large it was and the number of gates into it. However, with a bit of research, and some lateral thinking, I located Llwydcoed in the landscape and also some features within it, including a moated site. 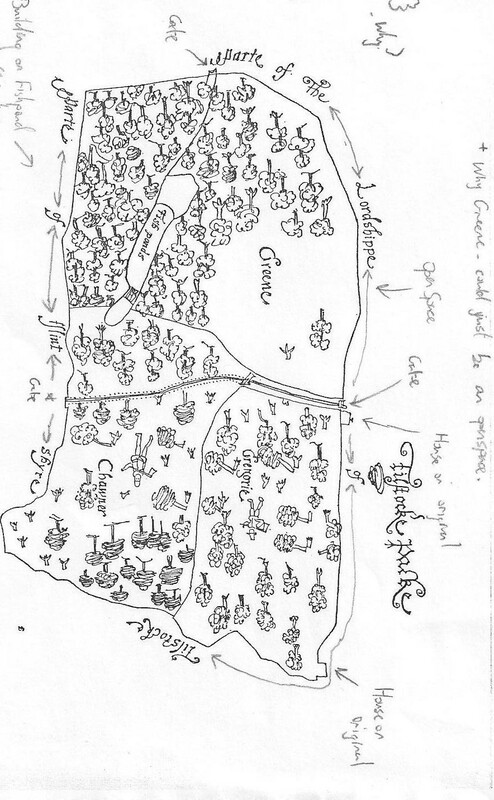 The second had originally been presented to the 4th Garden History Society Graduate Symposium in 2014, entitled: ‘Rills and Romance: Gardens at the Castles of Llywelyn ab Iorwerth and Edward I in Wales’. It was then rewritten and expanded before being presented at the Symposium by the Sea (SBTS) at Swansea University in 2015. A book, comprising the papers presented at SBTS is due out at the end of 2017 entitled ‘The Medieval and Early Modern Garden in Britain: enclosure and transformation, c.1200-1750‘, published by Routledge. After the double operation, my PhD tutor helped me suspend my studies so I could get my breath and my strength back. As I was recovering I received an e-mail from a friend of mine who was now working as a Commissioning Editor for the publishers Pen & Sword. She suggested that I should put together a submission to write a book containing all the research I had undertaken to date and submit it to her. After thinking about whether I could cope with the writing workload (on top of my day job with the Gwynedd Archaeological Trust http://www.heneb.co.uk) and discussing with some of my contemporaries who are also currently writing or have already written books I decided it was something I would be able to accomplish within the agreed timeframe. 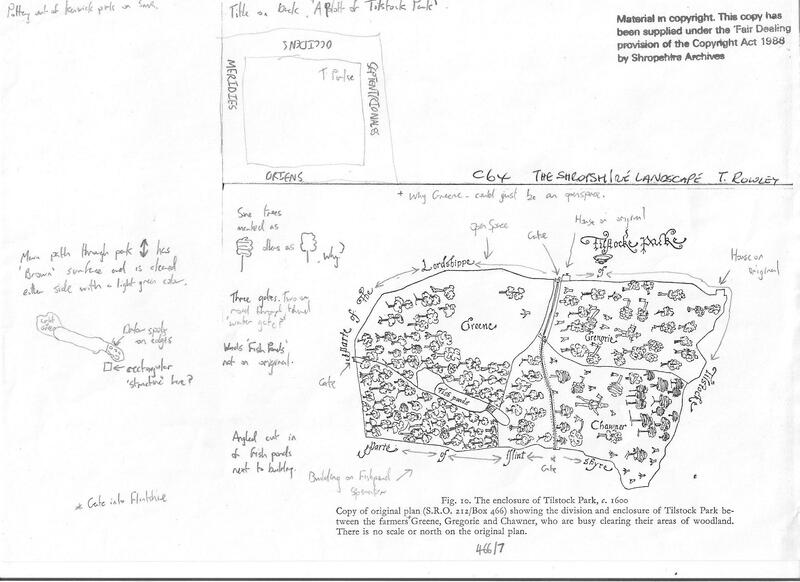 Currently the plan is to produce a book which draws upon both the latest archaeological and historical research, and which will also help archaeologists and historians locate ‘missing’ parks and gardens by presenting case studies to highlight what to look for. I’ll post my writing progress here, and again, thank you, I couldn’t do this without your support. Apologies for the lack of activity. I have been chronically unwell (again). That, coupled with the shear volume of material I had collected, and unfortunately also curated, meant I felt I had nothing constructive to offer by the way of a blog post. Finally however, my last operation – hopefully for a while at least – will be on the 22nd of April 2016, so I expect to be able to write happily unencumbered by the usual ever growing rock army of kidney stones. In among all this internal excitement I have also moved house. We (my wife and our three cats) now live in the flat which used to belong to my paternal grandparents. Built in the 1970s, it is light, bright and airy and most importantly my desk is now by a big window rather than tucked away in the far corner of the last place we lived. As part of the moving in process I decided I would re-establish the container garden my grandfather maintained, and pots and soil in hand I planted up some heather and lavender and replanted my wife’s strawberry plant. As I stood and admired my handy work from the kitchen window, arm deep in washing up suds, I decided I would work on the material for my PhD chapter on gardens. It is by far the weakest chapter in terms of content and structure, but the strongest in terms of the new discoveries I have made during the research process. Unfortunately, many of these ideas have gone straight into the lecturing notes and Power Point presentations, rather than into the chapter as they should have. for some context to the area of North Wales I’m talking about. The excavation was undertaken for a client who had planning permission to build a new house within a medieval burgage plot directly opposite the north-west corner of the Edwardian castle [A burgage was a town rental property owned by a king or lord. The burgage usually, and distinctly, consisted of a house on a long and narrow plot of land with a narrow street frontage]. A preceding archaeological evaluation, which examined only a small percentage of the total area of the site found medieval and post-medieval pottery and hints of some kind of ditch system within the plot. Documentary research established that the front of the burgage plot was now lost under part of a row of nineteenth century cottages, but the rear of the plot, as far as all the evidence indicated had been unencumbered by buildings and appeared to have always served as a garden in one form or another. My fellow archaeologist and I employed the services of a mechanical excavator to remove the considerable overburden dumped on the plot from the building of both the cottages at the front of the plot but also from the construction of another row of nineteenth century cottages to the western side of the plot. The archaeological excavation of the medieval deposits revealed that the rear of the plot had not been occupied by a property, but had served as open space within which over the following centuries a series of pits and ditches had been dug, some of which had animal bone within them. However it was something far more ephemeral which was uncovered that I was more excited about for my PhD research. The natural ground surface (that is the surface into which we find cut the earliest archaeological deposits on any site) was on one part of the site imprinted with the ends of tree roots. This was where a tree had established itself within the soil higher up than the natural and had then tried to extend its tree roots through the natural. In this case, the natural was a very hard and impermeable clay, meaning the tree roots left ‘dents’ as it tried to force its way into the ground. The site post excavation (after all excavation had been completed). Rhuddlan Edwardian Castle is at the top of the picture. Scale 1x1m. The indentations within the red circle are those left by the tree roots as they tried to push through the natural clay. Why are tree root indentations exciting? The Edwardian castle garden was only 80 metres (262 feet) away and planted on identical geology. Although all above ground evidence, except for the well within the garden has disappeared, the excavations reveal the kind of archaeological evidence we should expect if an excavation on the site of the Edwardian Castle garden was undertaken. And I haven’t given up on the idea that I could be the person to lead and carry out that excavation. You can also help fund my research – which has reached its original funding target. However if you like what you read, then you can still donate. Please help fund my research: http://www.gofundme.com/medievalgardensandparks – just over 50% funded to date. This week we are on the Shropshire / Flintshire border looking at Tilstock Park (Longitude 52.931698; Latitude -2.710032). 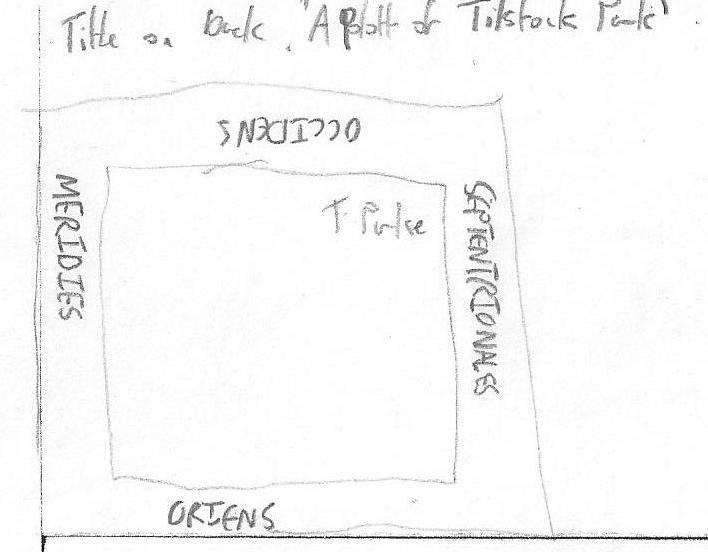 The earliest date for a park at Tilstock is 1361 when it is recorded in an ‘Inquisition Post Mortem’. An Inquisition Post Mortem recorded the lands held at their deaths by tenants of the crown. Back to our particular Inquisition taken in 1361, which was taken on the death of Ankaretta Lestrange. Although the park is not recorded prior to 1361, it must have been in existence prior to this date for it to be included. From 1361 to the end of the century there are records of the Parkers (those officials responsible for maintaining the parks) but in this post I want to look at the ‘death’ of the park, rather than its ‘life’. During my research I found this image which was published in Rowley, T. 1972 ‘The Shropshire Landscape’, Hodder and Stoughton, London. 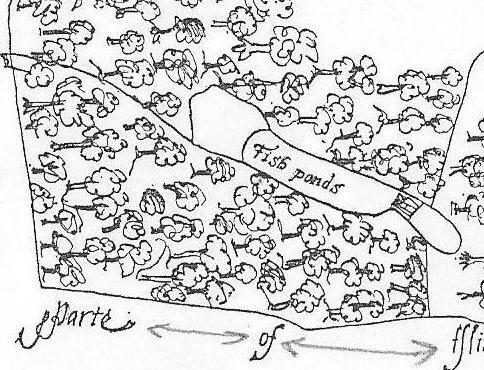 This map – produced c.1600 – shows the ‘death’ of Tilstock Park. With the trees being chopped down by men equipped with axes. Having looked at this map in the book, I wasn’t happy with the reproduction of the original as some things didn’t look quite right, and it said in the book there there was no north marked on it. Annotations on a copy of Tilstock Park c.1600. I thought I’d use my copy as it shows my ‘workings out’, and gives some idea of how I look for clues, both in maps and in the landscape. Firstly, the original map does have north marked on it, it just happens that it is written in Latin. Latin words for ‘North’, ‘South’, ‘East’ and ‘West’ around the edge of the original map. Another way of orientating the map would be to look at where the county of Flintshire is marked, and in this case the county of Flintshire should be to the west of the county of Shropshire. So, with the map orientated, what other clues can we glean from the map? Tilstock Park in its final incarnation had two gates, one on the western side and one on the eastern side. The gate on the western side had a park lodge outside of the park on the northern side, and there was another building in the north western corner of the park. On the southern side of the park was a water gate which allowed the flow of water to be controlled into a series of fish ponds on the south eastern side. Fish Ponds in Tilstock Park. Rowley thought that the park was divided into three – and in the ownership of Greene, Chawner and Gregorie. However, although Chawner and Gregorie appear to be depicted on the map, with axes over their shoulder, there is no sign of Greene. 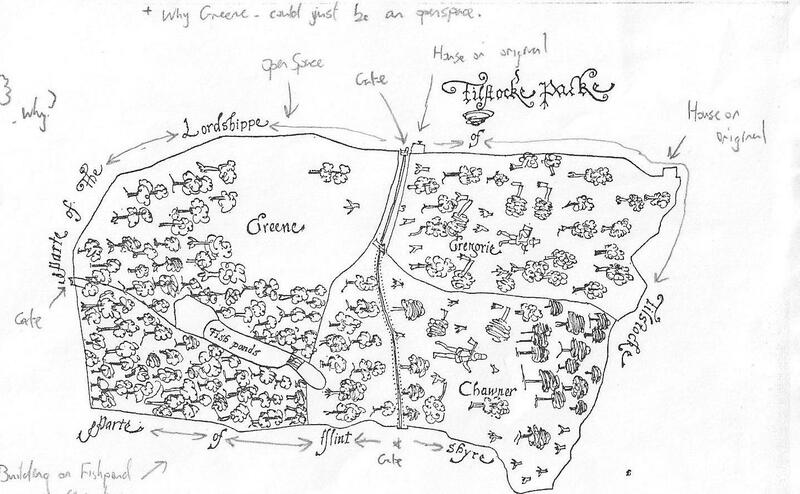 It would appear that in this case Greene refers to an open space, something we would expect to find in a medieval park. Chawner and Gregorie depicted with axes. Chawner and Gregorie are probably felling the trees in Tilstock Park in order to see them off and make some money as they change the use of the park from something which would have derived its income from a variety of sources, for example from the deer and other animals kept in the park, from the fish in the ponds and from the sale of wood. The park would now become an open space used as farmland, in this case pasture for sheep or cows. Armed with the knowledge the original map was kept in the Shropshire Archives in Shrewsbury, I went to see why it hadn’t been reproduced in the book and why Rowley had made a copy. When I saw the original, I quickly understood why. The map was in several shades of green with black ink illustrations on top. This meant it was very difficult to read, and even more difficult to photograph. So, what does Tilstock Park look like today? Tilstock Park Today in the wider landscape. The most obvious feature visible in the park from the air is the site of the former fish ponds. Tilstock Park Today. 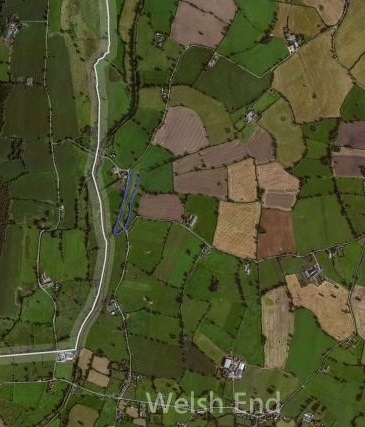 The edge of the former fish ponds is highlighted in blue. The boundaries of the park are also clearly visible, and next week we’ll look inside the park in greater detail to see what else can be identified in the archaeological record. looking at the ‘male’ and ‘female’ sides of the structure and architecture. But how does this structure relate to the wider world in which it was constructed? The answer interestingly, has been staring everyone in the face since the very beginning. Llanberis as a village saw little growth in the post-medieval period until two separate factors, the Industrial Revolution and the tourist trade changed the perception of the landscape and to a greater and a lesser extent respectively the landscape itself. The former need not detain us here, but the latter is important in terms of how visitors to this part of Snowdonia interacted with their surroundings. After the first pioneering tourists in the 1770s came the landscape painters. After the landscape painters, some of whom exhibited in places where their work was viewed by the British upper classes, came Royalty. They wanted, it seems, to see what all the fuss was about in this part of the country. Queen Victoria arrived in 1832. To honour her visit there was a Royal Victoria Hotel, a Victoria Terrace, a Pont Victoria ‘Victoria Bridge’ and a plantation of trees named ‘Coed Victoria’ – Victoria’s Trees. The hotel was constructed in the early nineteenth century to cater for the burgeoning tourist trade and was extended in late nineteenth century. ‘Parc Bach’ on the 1st edition O.S. map to the west of Dolbadarn Castle. ‘Parc Bach’ is Welsh for Little Park. 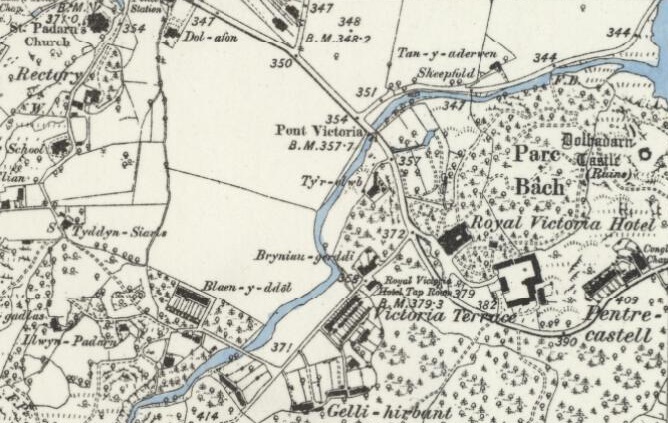 On the 1st edition Ordnance Survey map – dated 1888 – in addition to the panoply of ‘Victoria’ names there is an area to the west of the castle called ‘Parc Bach’, in English ‘Little Park’. The name ‘Parc Bach’ represents a survival of the Welsh royal landscape and provides an additional piece of evidence for the sophistication of Llywelyn and Joan’s castle. A little, or inner park was a park which was constructed in close proximity to a high-status residence from the twelfth century onwards. A little park could serve a variety of purposes, but was principally designed to serve as a backdrop to the buildings, and could also serve as a venue for staged events or entertainments. A window in the western gable end of the Joan’s hall would allow a view into the park, and an examples of this type of arrangement are known from Woodstock (Oxfordshire) and Windsor (Berkshire). 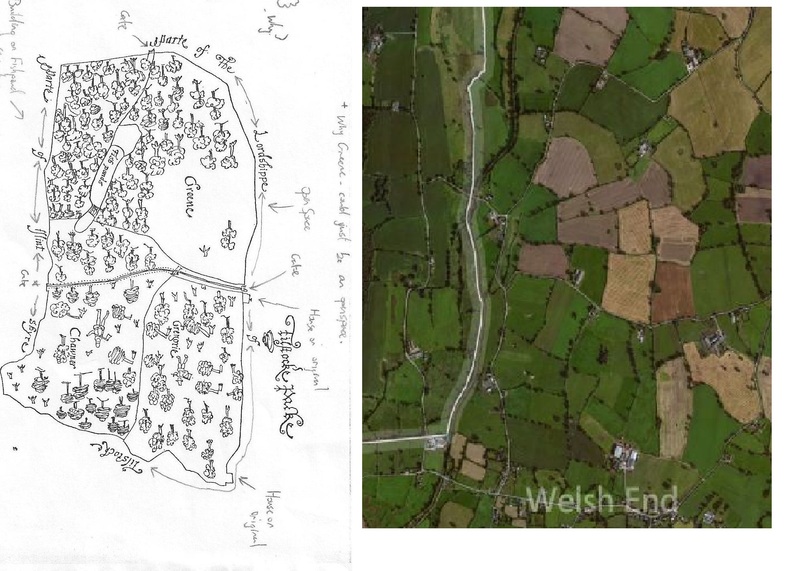 All the evidence presented in the last four blog posts has been recovered without the use of archaeological excavation and by using evidence derived from the maps, fieldwork and the visible architecture and I hope it has provided you with food for thought. In the next blog post we’ll be on the other side of my study area in Shropshire, looking at an early seventeenth century map and what it can tell us. 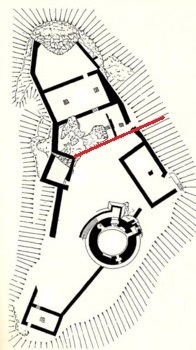 Plan of Dolbadarn Castle, area to be discussed is above the red line. The place and power of his Llywelyn’s wife, Joan – known as the ‘Lady of Wales’ – has been noted by historians, particularly Dr Danna Messer (http://independent.academia.edu/DannaMesser) in her recent PhD “The Uxorial Lifecycle and Female Agency in Wales in the Twelfth and Thirteenth Centuries”. Joan was a vitally important part of Llywelyn’s world, and her accommodation and social arrangements in and around the ‘female side’ of the castle are just as sophisticated as the ‘male’ side. 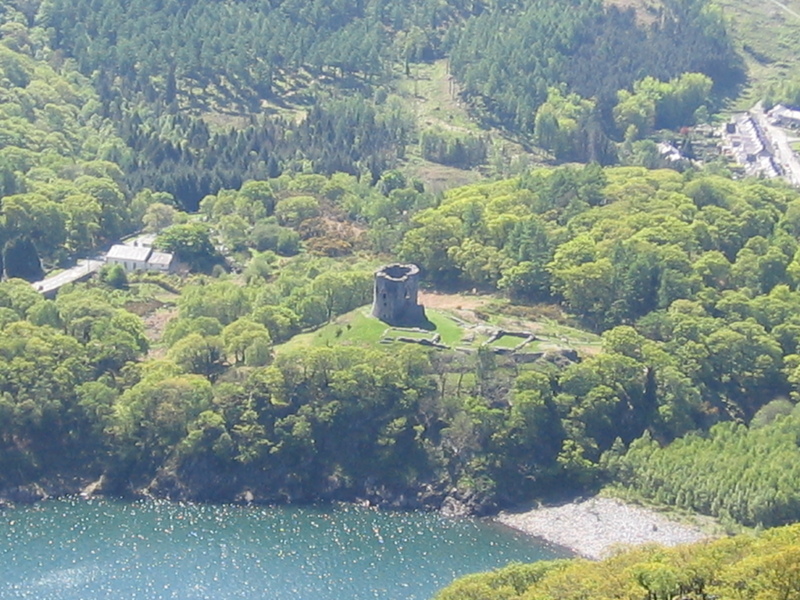 The entrance to Dolbadarn Castle is on the eastern side over looking Padarn Lake, now difficult to access because of the Ministry of Works post and wire face. Once the castle doorkeeper (someone who is mentioned in the Welsh law books) had granted access, then a visitor to Joan or her retinue would have turned right and passed through the fore-building attached to the castle curtain wall to arrive at the entrance to her hall. Historians have commented previously on the fact that the Welsh law book specific to the Kingdom of Gwynedd in the thirteenth century contains a considerably expanded number of staff for the queen. The queen in this instance is Joan, although no work had been undertaken to attempt to place her and her staff into any of the castle accommodation which would have existed and is visible in the archaeological record. This hall was excavated during the repair and restoration of Dolbadarn Castle in the 1940s, and unfortunately there are no records of any archaeology which was recovered during this work. Understanding how the hall was used through archaeological means does become more difficult, however there are other methods which can be utilised. Although the hall was excavated, the areas to the north and south were not disturbed. By examining these areas, there may be opportunities to understand the relationship the hall had to these areas and the castle as a whole. Dolbadarn Castle from the opposite side of Padarn Lake. Beyond the hall is a triangular space which has not previously been discussed in any great detail. This space, walled in and separated from the rest of the castle by the hall, would appear to have served as a garden for Joan when she was in residence. A garden could be created prior to the arrival of the Queen and her household, and an example of this is the garden at Tintagel Castle (Longitude 50.668936; Latitude -4.761529) in Cornwall. This garden would have consisted of potted plants which were put into the garden space. The advantage was that these plants could be moved with the female household. In terms of archaeological evidence, this can limit remains to broken and discarded plant pots or if the archaeologists are more fortunate, environmental evidence may be found. In the next post, I’ll look at how all these elements around Dolbadarn Castle form one sophisticated and complex royal landscape.